FAYETTEVILLE, Ark. 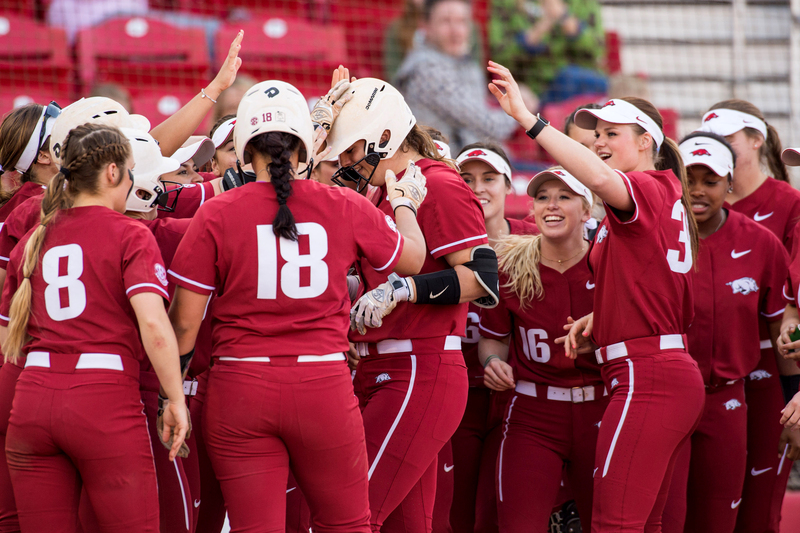 – With the help of four home runs Friday, the University of Arkansas softball team opened the Wooo Pig Classic with two wins at Bogle Park. Junior Katie Warrick was 4-for-4 with two home runs against Iowa State and fellow junior Ashley Diaz tallied five RBI with a home run of her own in the nightcap against Saint Francis (Pa.). The Razorbacks are now 9-0 on their home field this season and improve to 18-5 overall. The Razorbacks return to the field Saturday for day two of the Wooo Pig Classic with a game against Omaha at 5 p.m. (CT) and a rematch with Saint Francis at 7:30 p.m. Friday marked the beginning of a 13-game home stand for Arkansas which includes a pair of SEC series against Missouri (March 23-25) and Mississippi State (March 30-April 1). After plating the first run of the game with an RBI single in the first, Warrick continued the production with a two-run homer to deep left field in the third. The Chapel Hill, Tenn., native added her second big fly of the game with a solo shot in the fifth frame. Warrick completed her perfect night at the plate with a base hit in the sixth. Earlier in that inning, freshman Hannah McEwen hit her team-leading sixth home run of the season, a three-run shot to center. While the offense was going to work, freshman Mary Haff kept Iowa State off the scoreboard in four innings of work on her way to improving to 10-2 in the circle. She held the Cyclones to three hits and struck out five hitters with no walks. She gave way to sophomore Caroline Hedgcock who entered the game with a 3-0 lead. Iowa State scored once in the sixth and twice in the seventh but Hedgcock struck out the final hitter of the game to pick up a save. In a matchup of teams that played in last year’s NCAA Tournament, the Razorbacks jumped out to a 3-0 advantage in the third inning thanks to a three-run blast by Diaz. The home team extended their lead to seven with a four-run fifth that featured another RBI from Diaz and a bases-loaded, bases-clearing double off the bat of sophomore Aly Manzo. After Saint Francis got on the board in the top of the sixth, the Razorbacks responded with an RBI double by Diaz in the home half. Sophomore Autumn Storms picked up the win and improved to 7-3 behind 5.1 innings of work and five strikeouts. She faced a pair of two-on jams in the fourth and fifth innings but worked out of trouble to keep Saint Francis scoreless. Similar to the first game, the opponent scored three in the last two innings but with two down in the seventh, Storms re-entered to relieve Warrick and ended the game with a strikeout.